Mock waistcoat has button fastening. Fur chest with cravat has velcro fastening. 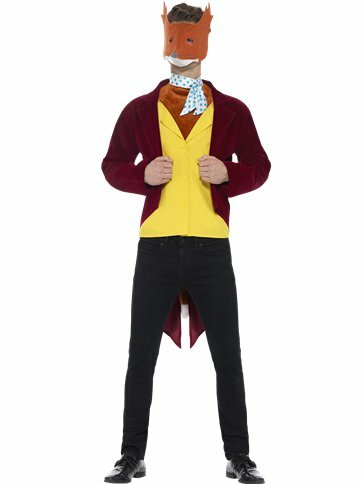 Jacket, mock waistcoat, fur chest with cravat and mask. The Fantastic Mr Fox is here! 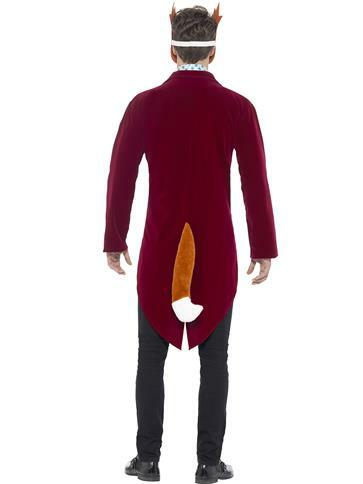 From one of the most well-known books written by Roald Dahl, this officially licensed, Fantastic Mr Fox is such an impressive costume featuring a maroon velvet look, fish-tail jacket with an attached fur tail and attached, bright yellow, mock waistcoat to front with button fastening. 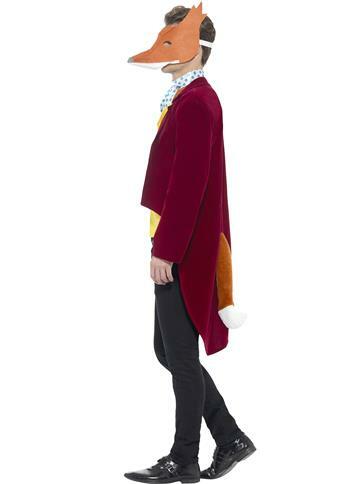 Completing this cunning creature costume is a fur, mock, chest front with an attached spotted cravat and an orange, felt, fox, half face mask with large eye holes with an elasticated strap to secure in place. Want it Friday, 26 April? Order it within 2hrs and 4mins and choose Premium by 9pm Delivery at checkout.